In the last few decades, Playa del Carmen has grown to become one of the most popular tourist destinations in the world. It has rapidly built up a reputation for offering stunning weather, clubs and, of course beaches. And once you arrive in this incredible part of western Mexico, you’ll soon find it hard to decide on where to eat, drink and which beach to relax on. At least, that was the case for us! With so many to choose from, it’s hard knowing which are the best beaches in Playa del Carmen, regardless of budget. 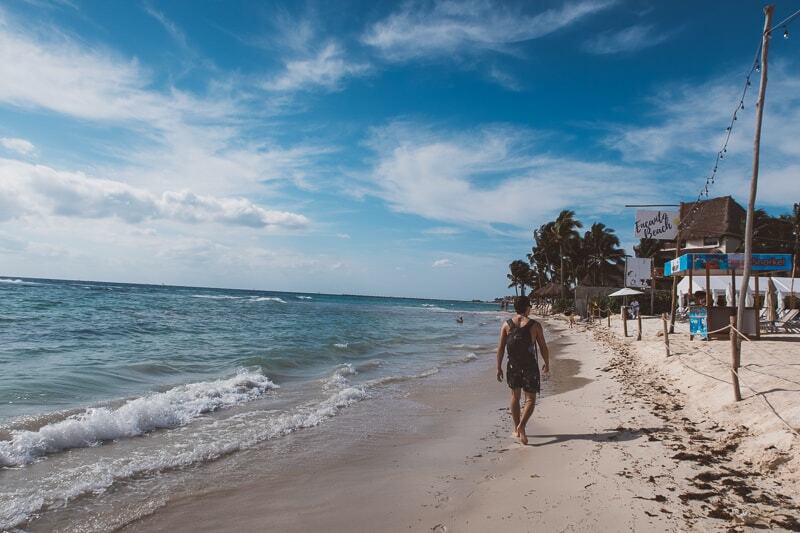 So, to help you out, here’s my go-to list of Playa del Carmen’s best beaches, plus a few more handy tips on how to make the most of your stay here. We quickly fell in love with Playa del Carmen, and found it to be a wonderful place to stay and relax. To find the best spots, we spoke to locals and then went out and walked up the entire coastline, trying out many beaches during our time in Playa del Carmen. How did I choose the 5 beaches in Playa del Carmen? 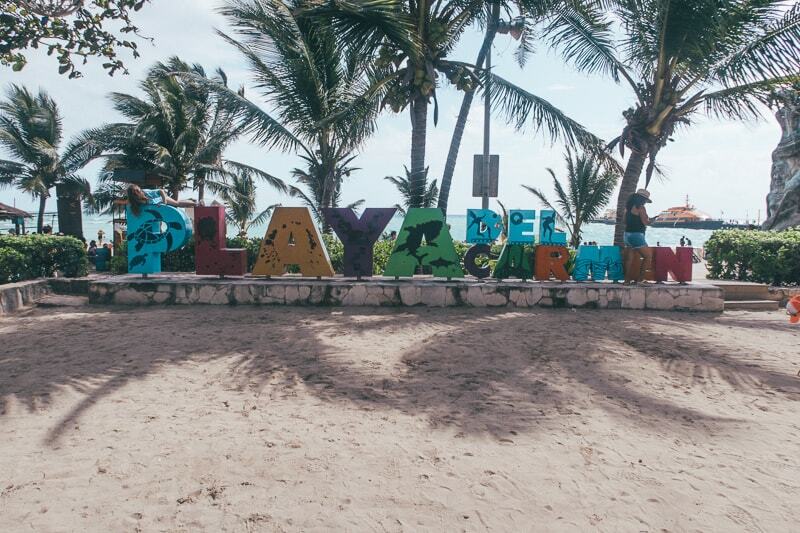 If you've checked out other blogs, you’ll soon have realised that there are more than a dozen beaches both in Playa del Carmen and outside of it. And what are the best beaches in Playa del Carmen? It’s hard to miss Parque Fundadores beach as it’s the large sandy beach located behind the iconic arch. This beach is located quite close to the ferry entrance for those hoping to take day trips to nearby islands. 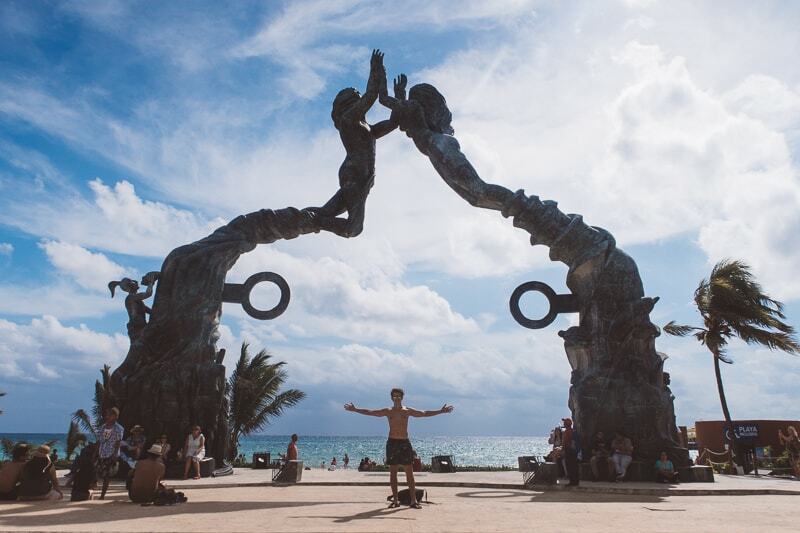 A trip to this beach isn’t complete without getting your photo at the arch, or the iconic “Playa Del Carmen” sign located right next to it. The line up to this beach has lots of great fruit stalls, so if you fancy some fresh fruit or even a smoothie, this is the place to be. There are also some good restaurants with cheap margaritas close to the beach as well! This is typically the end point of the main stretch of beaches, so many people don’t tend to sunbathe here as such. Instead it’s a reward for making it through the long strip of amazing beaches in Playa Del Carmen! If you want a picture at the arch with no one in it, you’re going to need to arrive super early. If you’re interested, this is also a good spot to play beach volleyball. Playa Del Carmen is bursting with amazing beach clubs. There’s nothing quite like relaxing on holiday, and then lounging by the beach with access to snacks and cocktails. 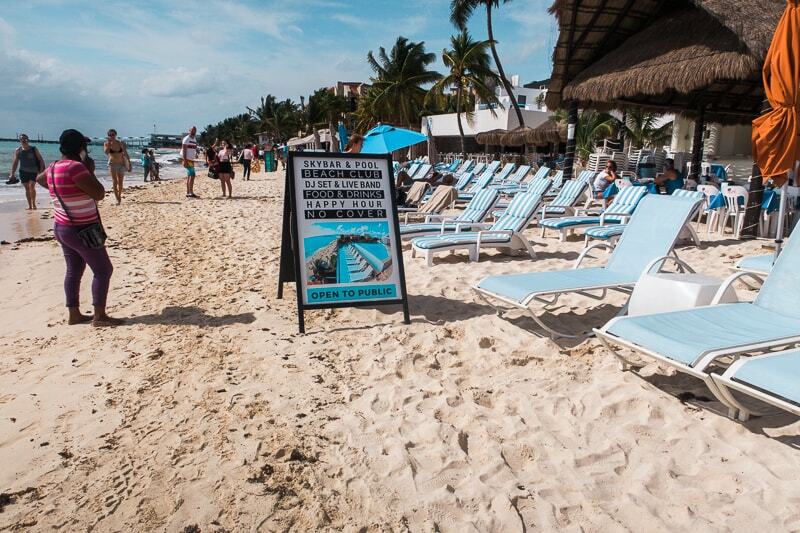 So, when it comes to beaches in Playa Del Carmen, this is where you’re going to find all the best beach clubs! With these beach clubs, you pay an entrance fee that basically goes towards a minimum spend on food and drink. 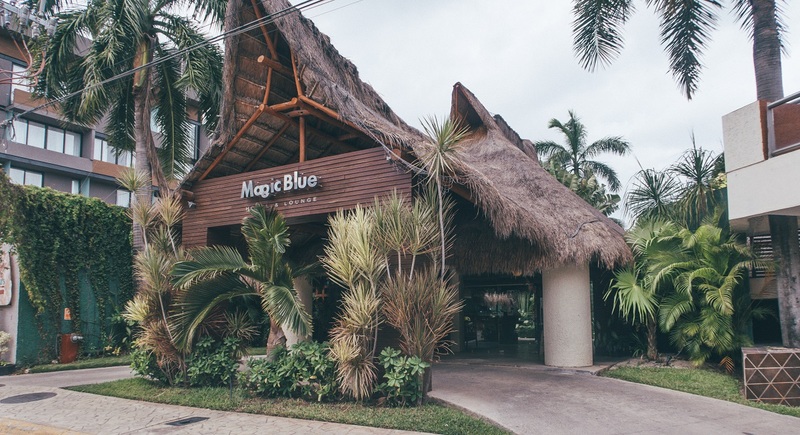 As a top tip, if you’re staying at the Magic Blue Boutique Hotel in Playa Del Carmen, then you get significant discounts on entry to each of these beach clubs! I would suggest simply wandering along the beach and deciding which one you like the look of and head on in. They all advertise their prices on the beach, and will try to get you in, so perhaps you can even negotiate a good deal if you are with friends. 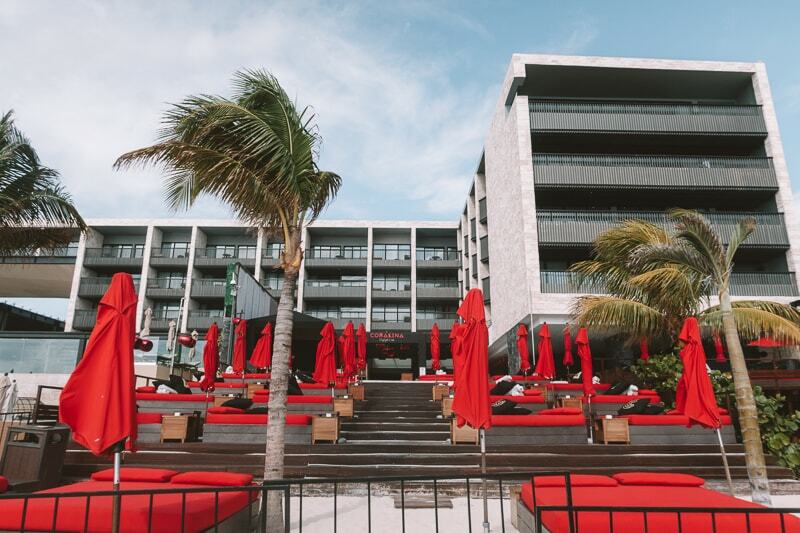 Basically, if you want a “day-party”, or some day drinking, there is no better way to do it than at one of the beach clubs in Playa Del Carmen. Mamitas beach is also home to Mamitas Beach Club. When we visited in 2019, it costs 800 pesos for entrance for 2 people, with 500 pesos credit towards food and drink. That will keep you sorted for the day. Oh and, they hold pretty cool beach parties too. Anyway, if you’re not entering the beach club, the actual beach is still a beautiful place to visit. We saw lots of people swimming in this area, and I’m not surprised as the water is clean, clear, blue and warm. On the beach, they offer rentals of jet skis, catamarans and banana boats; and you can also go parasailing. So this is where you want to be for water sports and having fun. Coco Reef is a “little off the beaten track”. You’ll need to walk four blocks from 5th avenue, making this beach a little further down. But don’t worry, the walk is nice and there are still lots of restaurants and bars that are a lot cheaper than those the center. So there’s a little money saving tip for you! Also, Coco Reef is an actual beach club/resort (all-inclusive might I add) that’s private. So that’s the reason the beach is called Coco Reef. You’ll find lots of people sunbathing in little corners of this beach, and there are quite a few fishing boats too. We also saw some people coming back and heading off on a snorkelling tour, and there are lots of people selling snorkel tours as you walk along, so I think it’s near a snorkel hot spot! This is one of the best beaches in Playa Del Carmen that we did not get the chance to visit, but that I wish we did visit. So, I’ve put it here so you can visit instead. This beautiful white sand beach is located 9 miles from downtown Playa Del Carmen, so you can quite easily get a taxi there and spend the day. The sand is regarded the most beautiful of all the beaches in Playa Del Carmen and I can see why. It’s quite quiet compared to other beaches, but there are lots of opportunities for kayaking, snorkelling and horse riding; and you can even swim with dolphins. Personally, I’d say this is a brilliant beach for couples wanting some quiet time, and for families who want a large, clean beach with lots of activities to keep the children entertained. Once again, there is no exact answer to the best resort, villa or hotel in Playa del Carmen. The city is filled with plenty of incredible places to stay, all designed to suit different budgets and tastes. So I’ve gone ahead and included three ideal choices, each one would be great for a different sort of traveller. Without a doubt, Coco Bongo offers the best nighttime entertainment anywhere in Playa del Carmen. It has become an iconic venue, which skyrocketed to success due to the incredibly popular Jim Carrey film, The Mask. Well, this hotel is located directly opposite Coco Bongo, so you don't get much closer to the nightlife! But don’t worry, the noise won't keep you up at all hours of the night. Instead, this wonderful little compound resort is surrounded by palm trees, making it still feel secluded and relaxing, away from the outside noise. Here, you’ll find a beautiful big pool, hot tub, on-site bar and one of the best all-you-can-eat breakfasts we have had anywhere in the world! The staff are so friendly and we had a wonderful time here, leaving feeling relaxed and refreshed. That being said, it’s close proximity to Coco Bongo and 5th Avenue make it perfect for heading out for a night on the town before heading back late to your large, comfy bed. 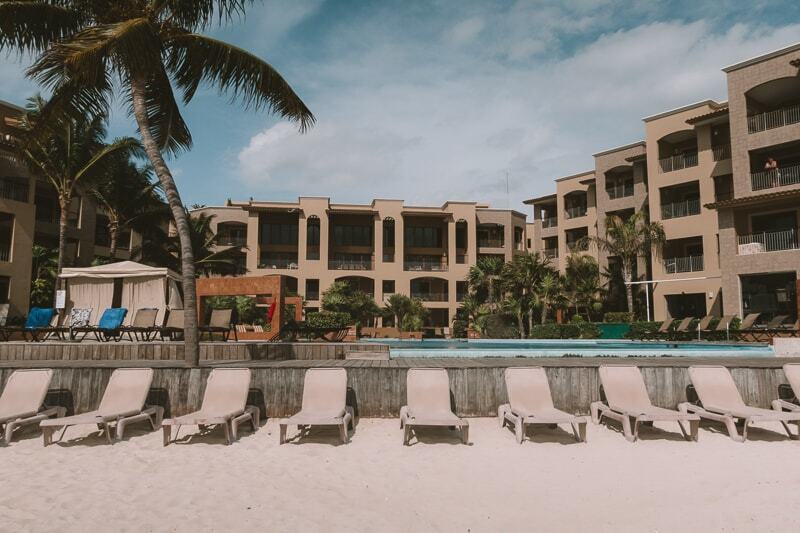 If you really want to make the most of the best beaches in Playa del Carmen, then you need to stay somewhere on the beach. 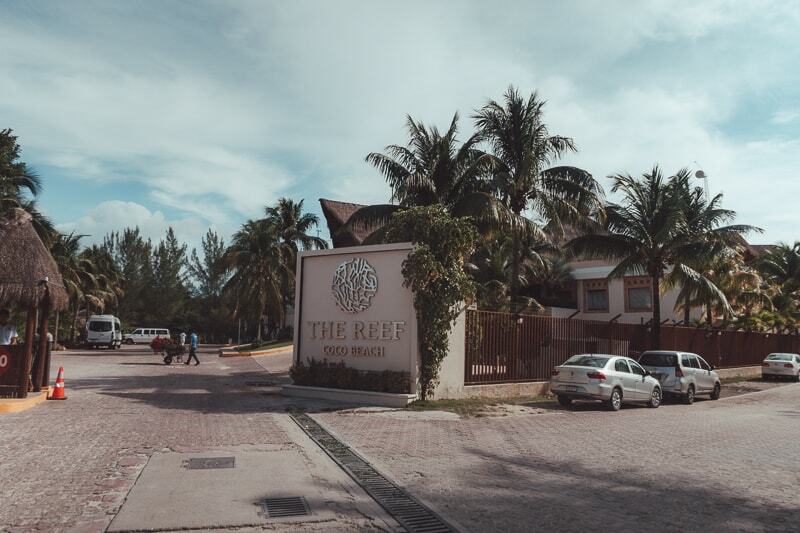 I chose this resort due to it being in front of perhaps one of the nicest beaches in Playa del Carmen, as well as relatively far from the main nightlife. As such, it’s perfect for escaping any noise and clamour of the nearby bars and clubs, whilst offering just a quick walk each morning to the beach. The resort itself is incredibly good value for money and offers a range of rooms at different prices. They are well known for their friendly customer service and incredible wellness and fitness facilities on-site. They also have a restaurant, bar and private pool to relax in, just back from the sea. Oh and, don’t worry, if you do plan on partying whilst in Playa del Carmen, then it’s still less than a 15 minute walk to Coco Bongo. If you’re budget backpackers keen to take in Playa Del Carmen’s best beaches, but don't want to pay to be right on their doorstep, then this is a great option for you. Rooms start from as little as USD$35 per night, making this easily affordable for most budgets. Allowing you to save more money for what matters, like happy hour drinks deals and sun loungers on the beach each day! Known rather simply as Private Room In Guesthouse, you still get the luxury of an outdoor pool and comfortable and clean rooms. Sure, you could probably find cheaper, but for the price, this is an awesome budget place to spend a few nights. What are the other best things to do in Playa del Carmen? As well as relaxing on the best beaches in Playa del Carmen, there are plenty more things to do here to keep you entertained for a week or more. I could probably create a list of dozens of great things to do in Playa del Carmen, but I’ve managed to narrow it down to what I believe to be the 7 best. 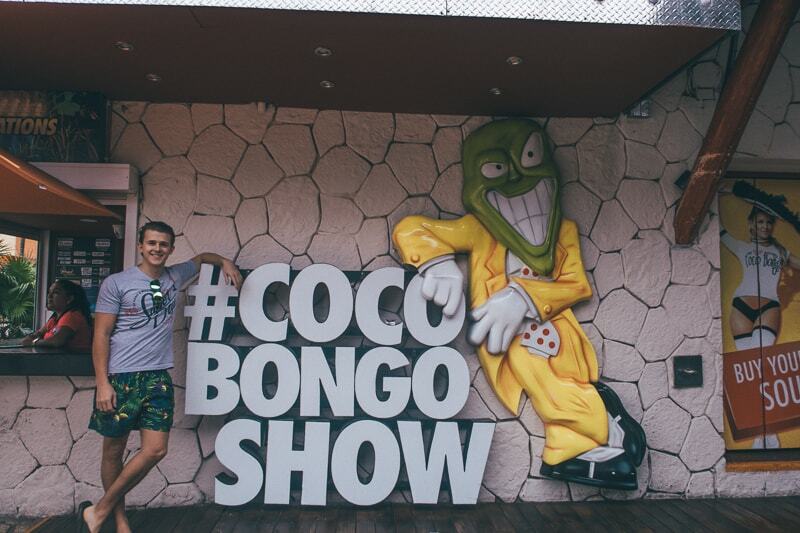 You have to go to Coco Bongo when in Playa del Carmen! It has literally become of the area’s most iconic sites and really is an epic night out. For a fixed amount of just $80 for basic entry, or $140 for upper tier entrance, you get free drinks all night and access to all of the awesome entertainment! If you pay the extra bit for the upper tier (which I recommend doing) then you get higher quality drinks, as well as somewhere to sit and table service. As a top tip, make sure you book your tickets earlier on in the day, so as to get a discounted rate. Better yet, see if your hotel has any offers on. We stayed at Magic Blue Boutique Hotel which was directly opposite Coco Bongo and they had a deal for 30% off entry! Despite it being such a popular tourist destination, it is still very easy to find cheap drink deals all across Playa del Carmen. And what better drink to have whilst in Mexico than the classic Margherita? As you walk down 5th Avenue you’ll find loads of bars offering enticing drinks deals to help lure you in. The best we found was 4 margaritas and a plate of chicken wings for just 170 pesos! Whilst staying in Playa del Carmen, it would be a shame to not take the time to visit other parts of the Yucatan coastline. Less than an hour up the road you have Cancun and in the opposite direction, but slightly further, you have Tulum. I would particularly recommend Tulum as a spot for a day trip as they offer some of Mexico’s best cenotes and Mayan ruins. Your cheapest option for getting to either Cancun or Tulum and back would be to head to the ADO bus station in town and book your tickets. They run all throughout the day and the terminal is located just behind Parque Fundadores. 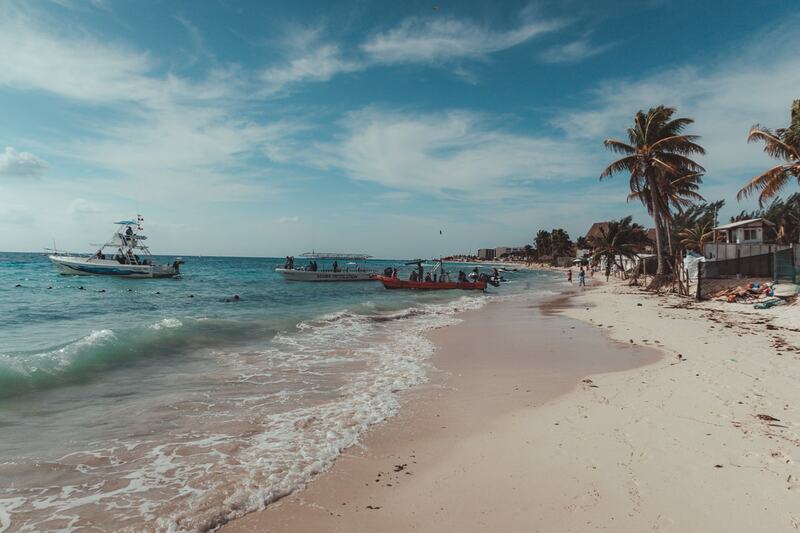 If you’re into scuba diving, then you’ll find plenty of chance to try out your skills in Playa del Carmen and the surrounding towns. You can book onto day trips and tours from a number of different agencies. Many of the most unique scuba diving opportunities around Playa del Carmen are the large cenotes. Once again, it might be good for you to head down to Tulum or the day as they have many larger cenotes to choose from. As well as offering endless tasty Margaritas and cervezas, Playa del Carmen is a great spot to sample your favourite Mexican foods. In the UK, Mexican food like Fajitas and enchiladas are growing increasingly popular and Cazzy and I have always been big fans. Luckily, we were not let down after sampling the cuisine in Mexico! If you’re on a budget, you can even head on over to cheap restaurants offering tacos for as little as 15 pesos a piece. 2 or 3 of these are enough to tide you over and they are surprisingly tasty. Or how about some watersports? As well as scuba diving, you’ll have plenty of chance to enjoy other watersports from the beaches in Playa del Carmen. Popular sports include jet skiing, paddle boarding and flyboarding. If you’re up for a real adrenaline rush, you can even go shark diving! In case you can't already tell, I absolutely adored being in Playa del Carmen. I’m usually not a massive fan of touristy places, but Playa del Carmen seemed somehow unique to me. Perhaps it’s because it is so Americanised and loud and exciting, that it’s hard not to fall in love with it. Sure, I don't think I'd ever want to live here, but I can definitely see myself returning in the years to come. I think I’d next love to give it a go during Spring Break, when the strip of clubs and bars supposedly hit levels of insanity it's hard to find anywhere else in the world. At least I’ll already know which beaches to head to in order to work off my hangover from the night before!